Doh Driver is an inspiring vegan activist, but not in the ways you might expect. She doesn’t make vegan movies, or write vegan books, instead, she uses her work and her everyday life as her activism. She co-owns a vegan restaurant in Seattle, she is the manager of a vegan store that supports a sanctuary for farm animals, and she’s a devoted vegan mother raising a now 12-year-old son. This unassuming woman is making such a difference just by living her life according to her values. We might all take some cues from her impassioned lifestyle. 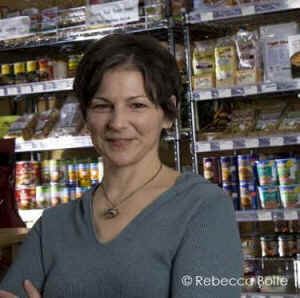 Allison Rivers Samson: You co-own a beloved vegan restaurant in Seattle called Wayward Vegan Café. What’s it like for you to run a restaurant? Do you spend a lot of time there yourself or is it mostly staff-operated? Doh Driver: Being a part of such a popular vegan restaurant is really rewarding, because I love making people happy. I find it especially gratifying that so many vegan customers bring their omnivore friends and family to our place, knowing they’ll leave satisfied and impressed by vegan food. There are four owners, and two of them (Tami and Colin Blanchette) manage the day-to-day operations, including menu development. For the most part, I do the bookkeeping and other administration-related tasks, and I do the really boring stuff like schedule the maintenance, pay the bills, and take the annoying sales calls. I also write the e-newsletter, which I try to have some fun with. We do have a great group of employees who keep things running smoothly when the owners are not there. We think it’s really important to employ only vegans, for many reasons. We want vegans to have gainful employment, and we want our guests to know that they don’t have to explain anything or wonder if the staff will respect their veganism. Allison: That makes a lot of sense to me, what a great situation! What’s the best-selling menu item at Wayward? What’s your favorite? Doh: Best-selling? Oh, that’s a tough one. To some degree it’s seasonal, and at times it just seems like suddenly, inexplicably, one particular item becomes high-demand. Still, the biscuits and gravy (and all their variations) will probably always be top sellers, because, y’know, yum. My favorite changes, too, and I’m on a burger kick for lunch these days, but ever since we started serving dinner my real favorite is the filet mignon (vegan of course!). Tami developed a truly melt-in-your-mouth creation that is just divine. Finish that off with our strawberry shortcake and I’m in a food-induced state of bliss. Allison: I’ll be right up! Here at AG we’ve also had the experience of a product suddenly becoming a wild seller. I bet someone, somewhere has studied that phenomenon. 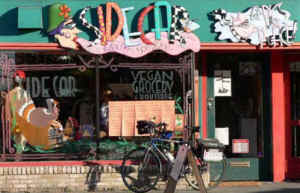 You also manage a vegan store, Sidecar for Pigs Peace, that supports Pigs Peace Sanctuary. Do you spend a lot of time with the animals? How do they affect your work? Doh: I do not (unfortunately!) 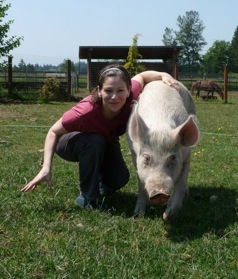 get to spend a lot of time with the lucky residents at Pigs Peace Sanctuary, which is an hour north of Seattle. I make up for it by making a visit or participating in a work party there several times a year. The animals are, however, ever-present in my mind, because most of the decisions I make about how I run Sidecar for Pigs Peace are informed by one question: will this benefit the pigs? Obviously, the store exists to support the sanctuary and as the store’s manager and only paid employee it’s my job to think in that way, but also, as a dedicated vegan, decisions in most areas of my life are informed by animals and how they will be impacted. I will say that working to benefit animals has radicalized my veganism, and has made me appreciate other vegans tremendously. My work is my activism, and I’m extremely fortunate to have the jobs that I have. Allison: I couldn’t have said it better! If all those activities weren’t enough, you have an awesome vegan son. How old is he and what has it been like for you to raise a vegan child? What’s the biggest challenge? Doh: I’ve had a lot of good luck raising my awesome vegan son, who is nearly 13 years old. While raising a vegan child is not hard, overall, there were certainly times when he was younger that I just wished the world was vegan so that food wasn’t such an issue! I went to great lengths to make it easy for the omnivore adults around my son – his distant relatives, his teachers, his friends’ parents – to feed him vegan food without stress. When he was in daycare, I got a copy of the kitchen’s menu plan and gave the caregivers ready-to-serve vegan versions of everything. 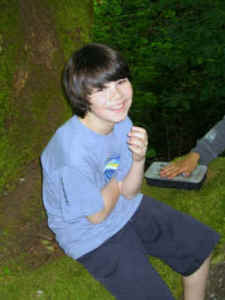 Once he hit elementary school, I gave his teachers vegan alternatives of whatever snacks they served. Come to think of it, the challenges were always the parties! A classmate would have a birthday and so the parents would show up at school – surprise! – with cake and ice cream, often without even alerting the teachers. I kept cupcakes in the teachers’ freezers, and whenever possible I would find out in advance what the parents would be serving at parties, but sometimes I would learn later that poor Griffin was given dry crackers while all the other kids had cupcakes, or that he was given non-vegan cake, among other disappointing revelations. He has such a sweet soul, the little guy never cried or complained. Mostly, though, people have been respectful, and those bumpy times did not rule our lives. It’s gotten easier as he’s gotten older. For example, he’s old enough to pack his own lunch each morning now, thank the stars. I have to admit, packing a lunch every day, year after year, was one parenting task I loathed and am glad to be done with! 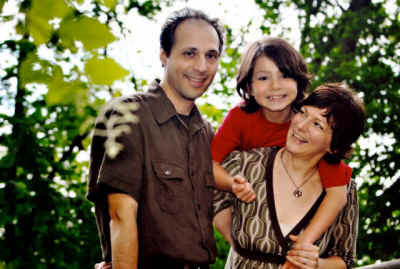 Allison: We have similar situations with our 5.5-year-old daughter, Olivia, who is also very committed to being vegan. I’m relieved to hear that it gets easier and I dream of the day when she makes her own lunch; thanks for that signpost! 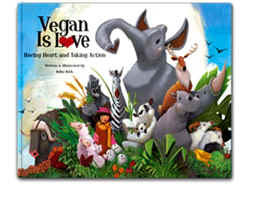 Doh: That somewhat addresses the nuts-and-bolts of raising a vegan kid in a non-vegan world, but there was also the challenge of raising a child to value and respect the lives of animals in a world that devalues and abuses animals everywhere you turn. From the lyrics of beloved kids’ songs and rhymes (in our house “This Little Piggy” ate tofu, and “Baa-Baa Black Sheep” kept all his wool) to the billboards that Griffin would read when he was still learning how (try to explain why cows who can’t spell would paint “eat mor chikin” on a sign, to a 6 year-old who’s learning to spell and doesn’t eat beef or chicken). The way society really views animals is pervasive and heart-breaking. I mean, when you’re an omnivore you just don’t realize the degree to which non-vegan messages dominate… everything! They’re all over the place! Do we really have to use animals to sell freakin’ insurance? Allison: Doh, you and I are of one mind on this. A good friend of mine shared with me the concept that “Privilege is blind to itself.” And in the instance of being an omnivore in our culture, there is a lens through which animals are viewed that is, to severely understate it, extremely limited. When we begin to recognize oppression toward animals, it can be overwhelming and that feeling quickly escalates to agonizing when raising a human being to be sensitive and “awake” to what is true and alive in her/his innocent heart. Doh: Plus, we didn’t have Ruby Roth when Griffin was little. When he was a toddler I just said that animals are our friends and we don’t eat our friends. That served him well enough for a few years, but when he was around 6 years old, he said he didn’t want to be vegan. When I asked what he wanted to eat that wasn’t vegan, he didn’t really know. I realized then that while a six-year-old can understand that vegans don’t eat animals, a six-year-old does not automatically understand the converse: that if we are not vegan, we do eat animals, and in order to eat them, they have to die. I had to update, for his age, my explanation of what it meant to be vegan. I then did another “update” when he was around 9 years old, because I realized that some of his friends may say things like, “chickens don’t die to lay eggs!” So I explained to him, more graphically, what happens to chicks and chickens in order for humans to eat eggs, just to give him one example of how animals can suffer and die even if we’re taking something from them while they’re alive. He was stunned! A couple of years later I took him to a screening of the newest version of Peaceable Kingdom: The Journey Home, from the amazing folks over at Tribe of Heart. It’s such a great film in many ways, one of which is that it alternates between horrifying images of animal abuse and heart-warming scenes of rescues and love, so viewers have a chance to recover and balance their sadness with hope and happiness. Griffin teared up a few times, but he watched the whole thing with open eyes and an open heart, and was able to get why we’re vegan in a way that no amount of words alone could have conveyed. Allison: Now I’m tearing up. Griffin sounds like an amazing person. Olivia once said that she wishes she wasn’t vegan and after we discussed the alternative, she decided she’d just prefer that everyone else was vegan. Sometimes I fear that I’m burdening her with this information, but truly it’s our society’s unconsciousness about it that permits these atrocities to continue and I value integrity, so I’m happy to give her that gift. I hear so many sad stories of adults who were tricked as children into eating animals and their deep sadness when they discovered the truth. I comfort myself with the thought that Olivia hasn’t been desensitized to the truth, which helps her sustain her open heart. Doh: Griffin doesn’t like any attention on him, especially attention that highlights how he’s different from other kids, so he’s fairly subdued about his veganism. When he has to do projects or essays at school, he doesn’t choose veganism as a topic. But he keeps himself vegan, everywhere he goes and under all circumstances. I hope that he always stays vegan; I tried not to make our veganism such a weighty topic that it becomes the thing he uses to rebel against me, but I also wanted him to grow up thinking it’s just weird to eat animals, and that animals are not food. And if he does decide as a teen that the way to assert his individuality is to eat animals, I take comfort that, as an adult, the food he’ll go back to, the things he considers his comfort foods, will be vegan. Allison: Sounds like you’ve gracefully walked a very delicate balance with that line, Doh. I have that same hope about Olivia’s future vegan comfort food. Can you share with us your current fave Griffin saying? Allison: That’s a great one, Griffin! Olivia tells me she’s here to teach people how to go vegan, among other things. Maybe we could connect these two one day. Do you have a favorite Allison’s Gourmet goodie? Doh: Seriously, you want me to pick just one?! Well, I could eat your caramels and truffles all day long, but I admit that I still lovingly remember the vanilla chai fudge I ate, like, 3 or 4 years ago. A-ha! I know what to ask for as a Mother’s Day gift! Thanks for talking with us, Doh! I so appreciate all your insights on veganism, animal rights and vegan parenting. Happy Mother’s Day!